Link your own page to Visual Paradox, a generous form of support. Plus, many search engines increase a site's ranking in their list by how many sites are linked to it. I've created this page to help you link effortlessly - just use one of the 3 link types below. Choose an image at the bottom of the page, right click on your choice (hold the mouse button down for Mac browsers). A dialog box will ask "Save this image as...." and you may download it to your hard disk. Replace the IMG SRC text (red) with the path and file name of where on your server you uploaded your copy of the image. Here's a couple text links you can cut & paste. Feel free to edit them to suit your site. <a href="https://visualparadox.com">3D Visual Paradox - Free 3D Wallpaper:</a> Weekly updated free hi-res, high quality 3D computer desktop wallpapers, startup/shutdown screens and free web graphics. Animate your desktop wallpaper! 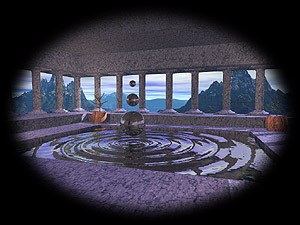 <a href="https://visualparadox.com">3D Visual Paradox</a> - Free 3D Wallpaper, hi-res and high quality, updated weekly. I can not place return links to everyone who asks. (See Yahoo counter below.) But if your site can send at least a few an hour, I will consider it. I have a few banners to choose from, and will add more when I get a chance. Please download the one you think will best suit your page.